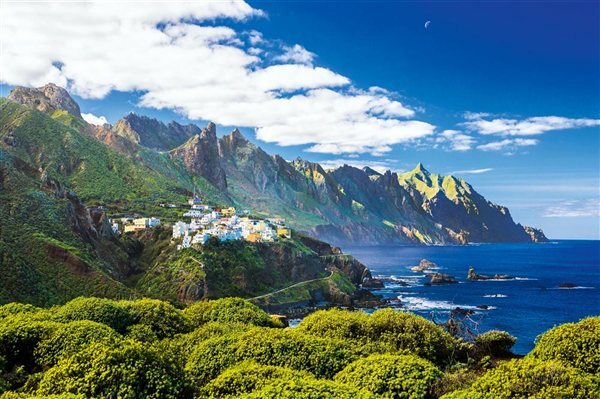 The Anaga Mountains occupy a large section of the northeast part of Tenerife and consist of coastline, ravines, forests and villages that are so remote it is amazing that anyone actually lives in them. This whole area is breathtakingly beautiful and full of twists and turns that will delight and amaze. Here you will find places of natural and scenic interest, such as the Roques de Anaga, interesting rock formations in the sea that have been reshaped by erosion and are natural monuments of Tenerife. With all its great beauty, the panoramic Anaga Mountain region is still relatively unexplored and small villages, cut off from the main roads reveal a “Hidden Tenerife”. In these villages some people actually still live in caves, visit, spend some time and discover! Anaga is an extremely beautiful area, full of spectacular contrasts, and home to a wealth of native fauna and flora, a direct result of the region’s isolation and ecological variety. It is a remote and wild area, characterized by humid forests, including laurisilva. This primitive jungle dates from the Tertiary Period and is only preserved in the Canaries, Madeira and several islands of the Azores. The main villages in the Macizo de Anaga are San Andrés, Taganana and Igueste de San Andrés. A place in the mountains which is called “El Bailadero” is believed to have been a place where witches were practicing witchcraft and dancing around a bonfire.